Thanks for bearing with me while I’ve been taking a short break. I’ve had a lovely holiday and been catching up with some needlepoint after setting myself one too many sewing projects since the New Year. However, there is one pattern I’ve been making over and over again – and that’s this one: Butterick B5510. After finding out I was pregnant last year, I finally had to give up plotting my own DIY wardrobe, and start on someone else’s! The little chap is due very shortly, and I decided to start with something very simple – the sunhat in size Nb (Newborn). Hopefully he won’t turn out to be so enormous that he’ll grow out of it straight away. I have no idea whether he’ll let me get enough time to sew in the weeks and months after the birth, but if he does, I’d like to try the shirt and trousers from this pattern too. 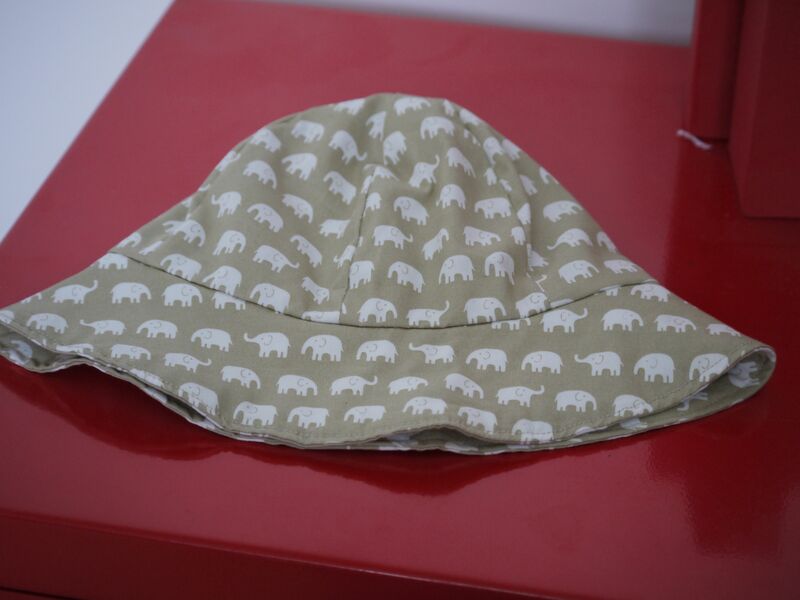 Here’s one of the finished hats in a cute elephant print fabric I found in Rags in Worcester. I’d like to try some other childrenswear makes as well – does anyone know a good website that sells the stretchy cottons that sleepsuits are made from? I’ve had a bad experience recently with some very thin cotton jersey and I’m looking for something that’ll be warmer and easier to work with. Next What equipment do I need?